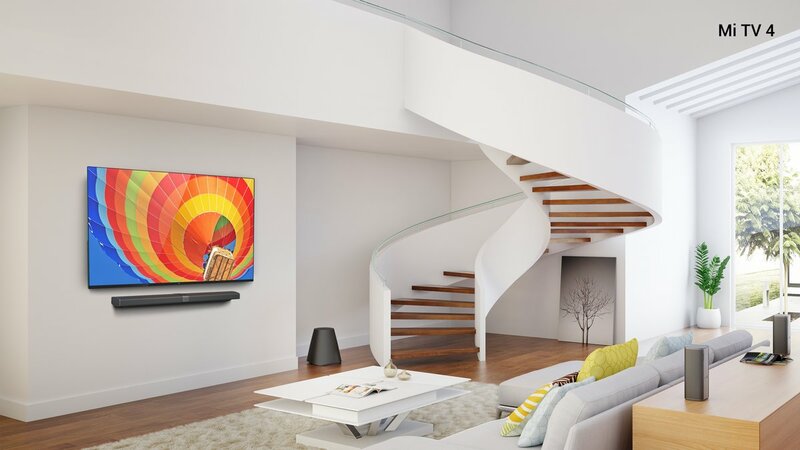 Xiaomi has launched Mi TV 4 at CES 2017.The Mi TV 4 features a 4.9mm frame at its thickness point with a modular TV design that separates the display from the electronics. It has a 4K display (3,840 x 2,160 pixels) and is powered by Quad-core 64-bit TV processor. It also features a Dolby Atmos audio technology with 2 up-firing speakers, that are basically pointed at the ceiling which reflects the sound to provide a 3-dimensional experience.It comes with Mi TV Bar that is integrated with 10 speakers, 2 wireless rear satellite speakers, and a subwoofer. Further, the Mi TV 4 comes equipped with“Patch Wall”, a UI layer on top of the Android OS that’s based on deep learning AI technology. It can curate content based on recommendations. Mi TV 4 will be available in 49-inch, 55-inch, and 65-inch variants. However, the 65-inch version will be priced under $2000 (Rs. 1,35,485 approx. ), that includes full sound bar set up with Dolby Atmos technology, while the standard version with normal speakers will cost $1500 (Rs. 1,01,610 approx.) . It will be available in China first later this year.